Based on the BLS report with July 2014 data. The U.S. Bureau of Labor Statistics recently released that 209,000 new jobs were added in July, a slight drop in economist’s prediction of 230,000 for the month. This caused the unemployment rate to raise .1%, going from a 6.1% to a 6.2%. 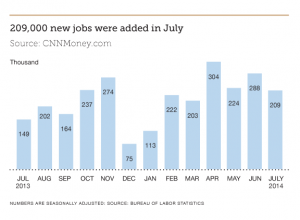 Over the past six months, +200,000 jobs have been added each month. Job growth within the U.S. continues to remain positive, but just at a slower pace than initially predicted. The labor participation rate increased from a 62.8% to 62.9%, showing positive signs that more workers are actively looking or found employment. Over the past six months, the economy has added 1.5 million jobs, making it the strongest six months for employment since 2006. With 47,000 newly added jobs in July, the Professional and Business Services industry once again reports consistent growth within the sector. As one of the top producing sectors of the 2014 U.S. workforce, the professional and business services sector has been pivotal to the growth of the workforce. The Financial activities sector added 7,000 jobs in July, a decrease from June’s reported 17,000 added jobs. The past two months have totaled 24,000 new financial jobs; the largest two month total for 2014 within the financial activities sector. With a projected economic growth in the second half of 2014, we can only expect to see financial jobs increase alongside the market. For the month of July, wages for the Financial Activities sector increased $0.04 from June. From July 2013 to July 2014, Financial Activities wages have increased $0.52. With little movement in the economy, financial jobs are limited to the market. With the predicted second-half economic growth of 2014, we should begin to see a positive correlation between market gains and newly added financial jobs.